The race to the first Harley-Davidson five-second run is heating up. 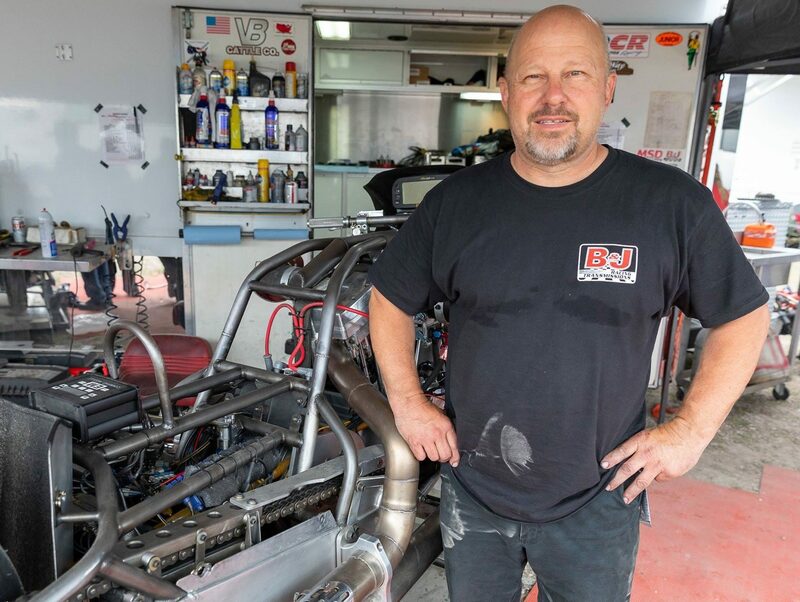 Cycledrag.com has learned legendary Nitro Harley racer Jay “The Bulldog” Turner will enter his brand new, innovative, supercharged Nitro Harley in the season-opening NHRA Winternationals from Pomona, Calif. Feb. 7 – 10. The multi-time champion has been hard at work on his state-of-the-art “Lucky 7” Pro Charger-equipped Harley for over a year. As the off-season began it initially looked as if superchargers would be banned in the NHRA Mickey Thompson Top Fuel Harley category. Sources say an influential NHRA force is of the belief leaving the class open to superchargers could potentially destroy it. After much discussion amongst the competitors and negative feedback to the NHRA, the organization decided to allow superchargers and will continue to closely monitor performance to maintain parity. Turner is very optimistic about the new combination and gave us a close look at his blower bike at the Man Cup Finals in November. Turner has a long and storied history in the sport. He has accomplished a great deal. This will be his first attempt at campaigning a supercharged bike. Last season Walt Sipp from Pro Charger explained to Cycledrag how a supercharged Nitro Harley works. Most experts agree a supercharger has the ability to easily push the nitro twins into the five-second zone, but so far lack of consistency and dependability has been the issue. Tak Shigematsu of Japan often has a difficult time making a clean run on his supercharged Nitro Harley, but when he does it’s spectacular. At the 2017 Man Cup Finals Shigematsu set the Harley-Davidson world record with a 6.02 on a far from flawless pass where he brushed the wall and broke his handlebars. It was more evidence that the combination could run deep into the fives. However Shigematsu was plagued with mechanical gremlins for much of 2018 and was unable to make first round at last season’s NHRA opener. Shigematsu backed up his epic 6.02 with a 6.06 this past November in Valdosta. Jaska Salakari of Finland holds the world record for a v-twin dragbike having clocked an impressive 5.83 on his supercharged machine last season at the Tierp Arena in Sweden. Salakari’s configuration is much different though from what is considered a Harley platform. Salakari runs double overhead cams and electronic fuel injection while the supercharged Nitro Harleys use pushrods and mechanical fuel injection. Salakari has stated he feels his combination still has a lot of room for improvement and boldly predicted 5.40s. The quickest run on an injected Nitro Harley is a 6.14 by Joey Sternotti at South Georgia Motorsports Park in AMA Dragbike in 2010. Turner holds the official NHRA record with his blast of 6.16 in Epping in 2017. It puts the best performance of a supercharged Harley and an injected Harley only .12 apart with a major consistency advantage going to the non-supercharged bikes. It could make for some intriguing racing. Jason Pridemore of Ohio was the only other competitor to enter an NHRA race aboard a supercharged bike last season. Pridemore found success, advancing to the semifinals at the U.S. Nationals with consistent runs in the 6.50-zone. Pridemore tested his crowd-pleasing creation at the Man Cup event at Dragway 42 in West Salem, Ohio in July. The majority of Top Fuel Harley racers were in favor of keeping the supercharged bikes legal, with many of them citing the incredible amount of work Turner, Pridemore, Shigematsu and others have put into their programs. 2018 class champion Tii Tharpe says NHRA made the right decision and is applauding the efforts of his teammate Tuner. “I think it’s great. You may just see me on a supercharged bike if it doesn’t scare the hell out of me,” laughed Tharpe. Tii Tharpe, Jay Turner and Maddy celebrate a NHRA title. Tharpe isn’t buying the argument that the inconsistency of the supercharged bikes and lack of close races will hurt the racing. Tharpe thinks his teammate has a great chance to be the first in the fives and says it will be interesting to see how the supercharged bikes are viewed by the other competitors after that milestone is achieved. It’s yet another reason to get excited for what should be a memorable season in NHRA Top Fuel Harley. All 10 events will be aired on FOX Sports with select events on the FOX broadcast network. With over 575 hours of programming, fans can tune-in to action from Friday and Saturday qualifying rounds as well as Sunday’s eliminations.